Hooray! Another portrait season launched and the porch is officially open for business. I had a visit yesterday from this adorable twosome – look at those sparkly eyes! They were just the perfect mix of sweet and shy with a wee hint of sassy. 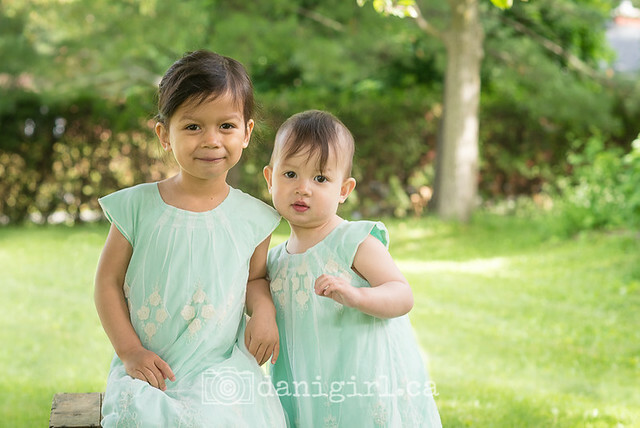 And oh those matching dresses! I’m sure I’ll be sharing more of this session once I finish sorting through the photos. Weekend bookings are filling up quickly, so if you’re interested in playful summer portraits of your family, please get in touch soon! Next post: Manotick families, support the proposed “pool to school” pathway!